I *just* had my first recipe request! How fun! A “recipe to improve the dating life of a random college student out in Washington, DC“! I racked my brains for the perfect dish that would be affordable on a student budget, relatively easy to cook but still feel special, and of course, be super tasty. I was reminded of a pasta dish I used to regularly make (why did I stop?!? ), I originally named it “If salad and pasta got together and had a baby…” but that sounds a little weird so Arugula and Goat Cheese Pasta it is. 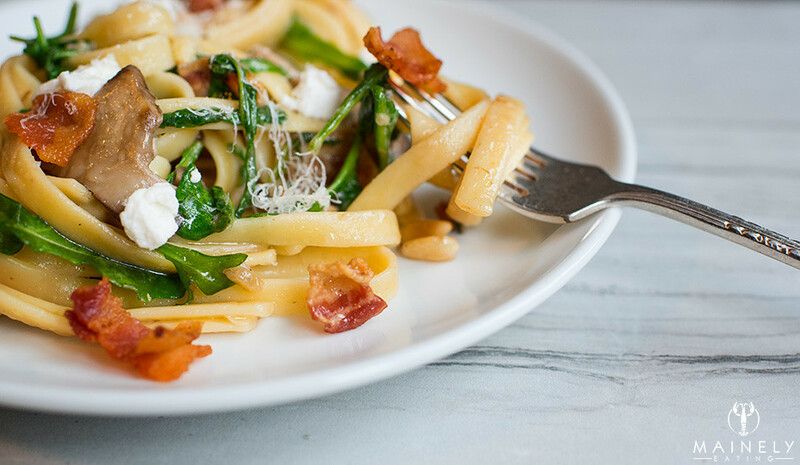 The peppery herbaceous flavor of the arugula cuts through the slippery pasta rich with the creamy goat cheese. Fun fact – arugula is known as rocket in the UK. This is a very flexible recipe, if your date happens to be vegetarian you can easily skip the bacon (just start cooking the onions in a little olive oil and butter) and swap the chicken stock for vegetable stock and it’s still really delicious. If you’re fond of mushrooms you can add more (I usually do the full 10 oz – half regular white mushrooms and half whatever looks good in the store – chestnut, shitake, oyster). You can kick the taste up with thyme or parsley, pine nuts and a squeeze of lemon juice but if you don’t have those ingredients, it won’t ruin your date night. If you’re an experienced cook, you can chop as you go but if you’re newer to cooking I’d recommend having everything prepped (onions, garlic, mushroom chopped, cheese grated/crumbled) to remove any stress. Bonus – if you’d like to cook together, you can assign mushroom chopping or cheese grating to make it into a team-effort dinner. Cliffnotes: cook the bacon until crispy, remove and set aside, cook the onion in the bacon fat, add the mushrooms and cook until nutty and brown with a little garlic, remove and set aside. Add chicken stock and reduce by 50%. Add mushrooms back to pan. Add freshly cooked pasta (reserve cooking water! ), butter, parmesan (if using) and toss. Add arugula, crumbled goat cheese and pine nuts (if using). Salt, pepper and a good squeeze of lemon juice. If dry, loosen with pasta water. Top with crumbled crispy bacon and a little more goat cheese. 3. Brush any dirt from the mushrooms and chop them into slices. Remove the woody stems from shiitake mushrooms if using. 4. Grate the parmesan cheese (if using), crumble the goat cheese into little pieces like small popcorn. 6. 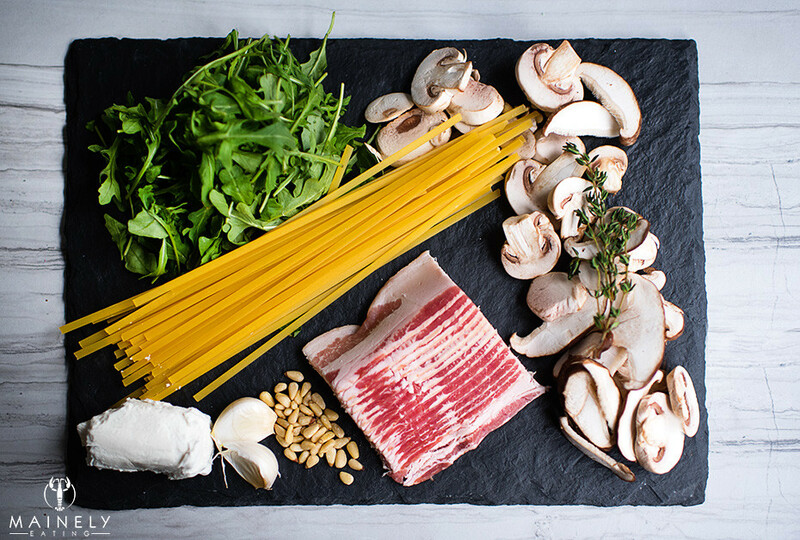 In a large pan (large enough to eventually hold all of the ingredients AND the pasta), cook the bacon over a very low heat for a few minutes. The fat will start to render out and you can turn the heat up higher until the bacon reaches the desired level of crispness. Stir regularly to stop the bacon sticking. 7. Remove the bacon and set aside. Lower the heat and add the onions, cook until they are translucent (about 3-5 minutes), stirring regularly. 8. Add the mushrooms (salt and pepper too!) to the onions and continue to stir regularly over a medium heat. If your pan seems dry, you can add a glug of olive oil. Cook until the mushrooms are just starting to turn golden and then remove the mushroom/onion mix and set aside. 9. Add the chicken stock (don’t worry if there are a few pieces of mushroom or onion left in the pan, they’ll add more flavor) and turn the heat up high, stir to loosen any tasty brown bits in the bottom of the pan. Cook until the chicken stock is reduced to about half (about 5-10 minutes). Turn the heat way down to the lowest setting and add the mushrooms/onion mix back to the pan. Taste and add salt/pepper if necessary. 10. Put the pasta in the boiling water and cook according to package directions. Drain in a colander and try to save some of the cooking water (set a mug under the colander). 11. Add the pasta to the mushrooms, add a large knob of butter and parmesan (if using), toss vigorously (tongs or a couple of forks). If things seem dry, add a good glug of the reserved pasta water (the starchiness will help bind everything together). 12. Add 3/4 of the crumbled goat cheese, arugula, pine nuts (if using) and a good squeeze of lemon juice. Toss again. Add the bacon. Final toss. 13. Serve in warmed bowls/plates (from the oven on the lowest setting), with the rest of the crumbled goat cheese on top. Mushrooms are tricky little fungi, they usually go through a mushy stage when they’re officially cooked but not looking too appetizing. You can stop cooking at this stage and it won’t have a major adverse effect on your dish but if you can bear it, keep the heat high and stir regularly, watch the mushrooms like a hawk and you’ll be rewarded with a just browning/nutty tasting mushroom that will be absolutely delicious. 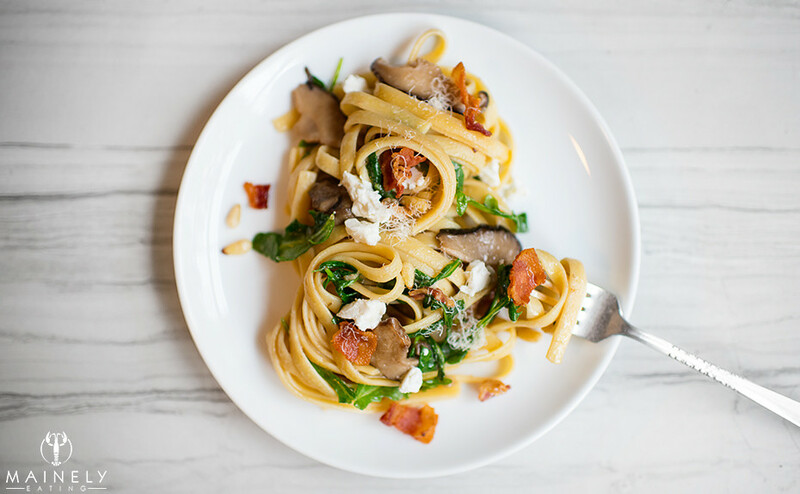 The last few steps all happen in a matter of seconds (adding the pasta, butter, parmesan, arugula, goat cheese, pine nuts) so having everything ready and bowls/plates warmed and ready to go will make your life easier. You know how some nights you’re all “Let’s go for a walk and eat a superfood salad! ?” and then other nights you just want to lie on the sofa in your PJs with a blanket and shovel high carb food into your mouth? Yup? 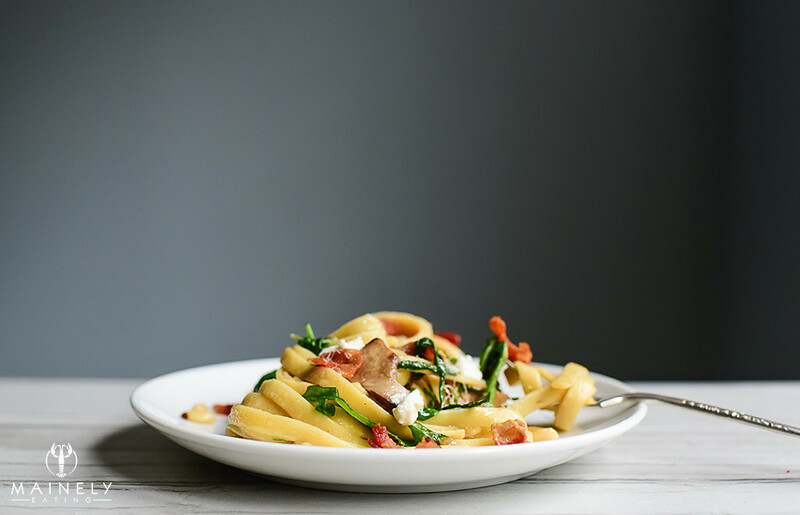 Well this is the pasta recipe for those sofa nights. A super fast, super indulgent dish with just enough time built in to get your PJs on and find your new series on Netflix. I don’t know about you, but we’re DYING for Series 4 of The Americans on FX and this will totally be what we’re eating during the series premiere. 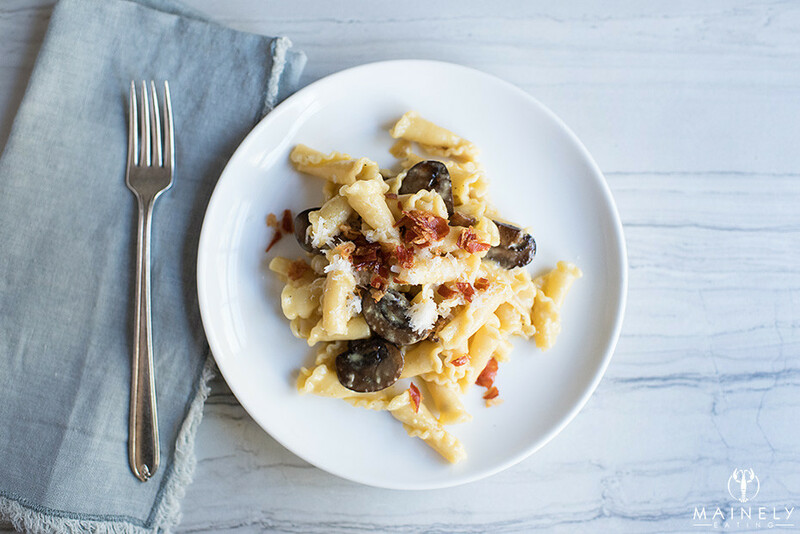 What’s not to love about a 5 ingredient dinner – pasta, eggs, mascarpone (or heavy cream), pancetta and mushrooms plus a few storecupboard staples – salt, pepper, butter, garlic, onion and parmesan. As least I count butter, garlic, onion and parmesan as “essential” items in our home 😉 and it takes maybe 15 minutes to prepare. One of the unsung hero ingredients in this dish is the leftover pasta cooking water – the starchiness brings everything together! Simply cook the mushrooms and a little garlic in butter until brown and nutty, remove and cook pancetta, add onions, add back cooked mushrooms. Mix eggs and mascarpone. Grate cheese. Cook pasta (reserve cooking water!!!!) and add to pan (off heat), throw in a handful of cheese (channel Mickey Mouse size hands for this), a big splash of the starchy cooking water and then add the mixture of eggs and mascarpone cheese. Toss vigorously and serve in warmed bowls. Actually, you could probably make this in 10 minutes if it wasn’t for my insistence that mushrooms should be cooked separately. I love my mushroom friends but they tend to color everything else…well, mushroom color. If you’re happy eating grey food, then by all means cook the mushrooms at the same time as the onion and skip step 1. At best this is a VERY incorrect carbonara (the pancetta should be replaced with guanciale, mushrooms are uninvited imposters, onions and garlic are as welcome as a coven of vampires in your home, mascarpone or heavy cream is all kind of sacrilegious and WHERE IS THE SPAGHETTI?!?!? ), but here’s the thing, it tastes pretty great. And the addition of the mascarpone or heavy cream reduces the risk of your eggs scrambling in the pan. You’re welcome. 8 oz mushrooms (I used chestnut mushrooms but baby bella or regular white mushrooms work too! ), if you have a sprig of fresh thyme or some fresh parsley, throw it in. 4-6 oz of dried pasta. 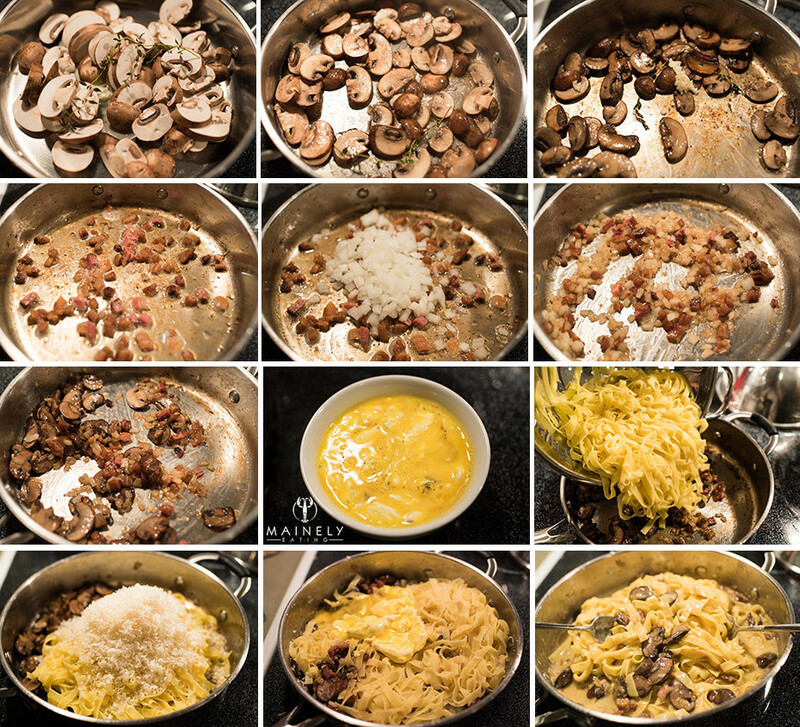 I have a fondness of De Cecco egg fettucine (it comes in nice little nests, 1 nest per person is perfect) – you’ll see it in the step-by-step picture or a nice ruffled pasta as in the top picture. Saute sliced mushrooms in a large pan (you need to have room for everything in this pan later) with a little butter over a medium heat until golden brown and just starting to smell nutty. Add garlic for the last minute of cooking. Remove to a plate/bowl. Put a large pot of water on to boil, salt generously. In the same pan that you cooked the mushrooms in, add the diced pancetta and cook over a medium heat (stirring regularly) until the fat has started to render out and the pancetta is getting crispy. Add diced onions and stir vigorously so the moisture in the onions loosens up the browned crispy bits (fond) on the bottom of the pan. When the onion is lovely and soft and just on the verge of turning golden, add the mushrooms back to pan and reduce the heat to the very lowest setting just to keep everything warm. 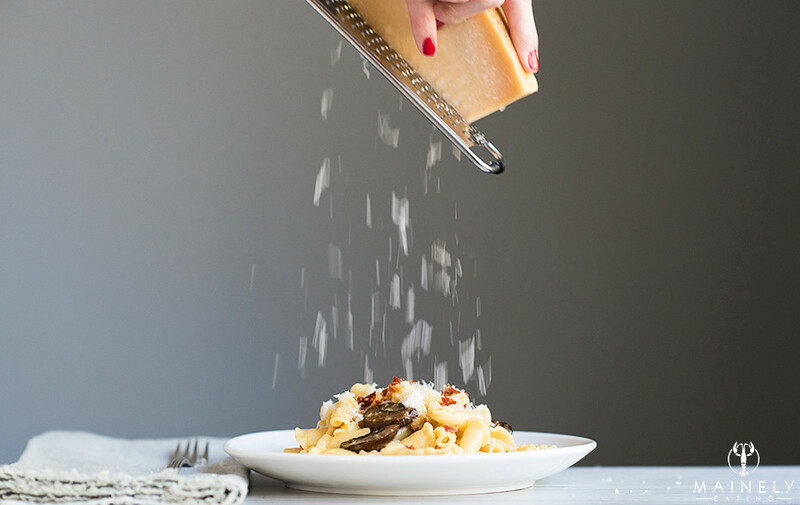 Grate the cheese with a microplane grater. 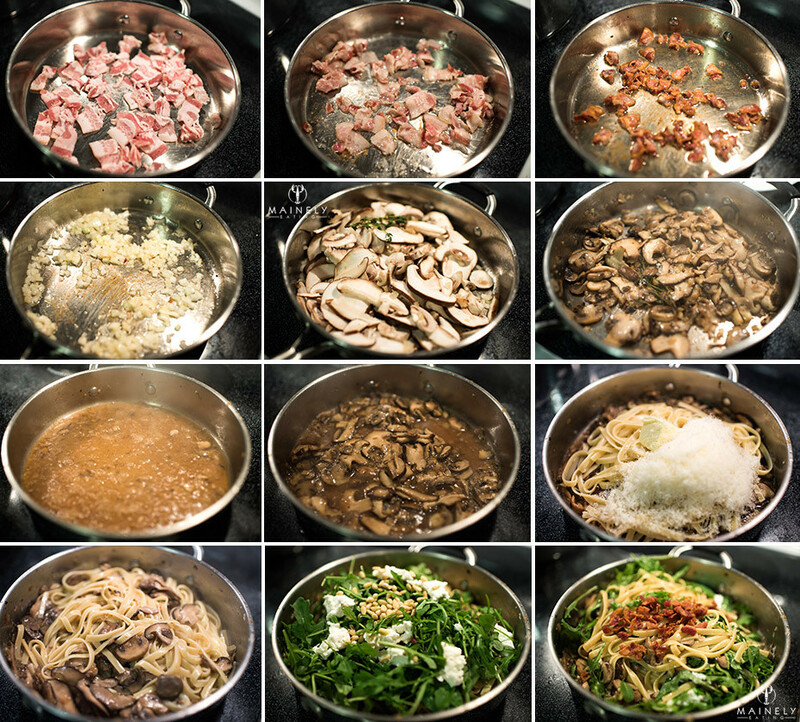 With the pan OFF the heat, add the drained pasta to the mushroom/pancetta mix. Add the lumpy egg/mascarpone mixture and toss like crazy. You don’t want scrambled eggs! More of a silky, creamy, rich sauce. Add more pasta water if things look dry. Serve on warmed plates/bowls and add a final shaving of fresh parmigiano regiano. What’s your must-watch TV series at the moment? What should we watch next? We’re all caught up on Making of a Murderer, House of Cards, The Americans, True Detective…. I’m a HUGE fan of Adele. I was lucky enough to fly to Belfast to see her perform live in Belfast on the first night of her tour. Adele was the best part of the trip but coming in a close second was the delicious food we got to eat. 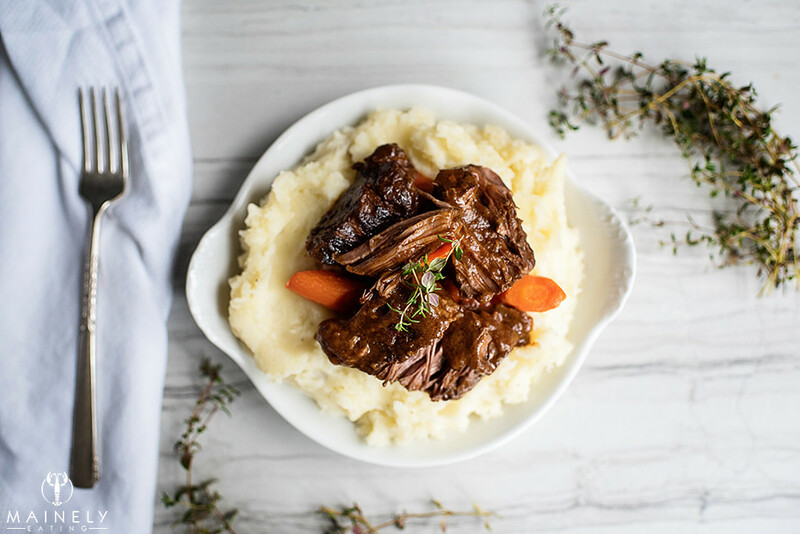 A traditional Irish stew is made with lamb but Whole Foods had a good deal on local Maine short ribs so I decided on a braised short rib in ale this chilly weekend. I’ve previously made this braise with Guinness Irish stout and found it a little too intense and bitter so I plumped for two bottles of local Maine beer. The first is a rich Irish-style black stout and then to counter the richness, a lighter Belgian-style saison ale both from Allagash Brewery. Murphy’s or Boddington beers work well too. Worcestershire sauce and tomato paste boost the umami flavors. 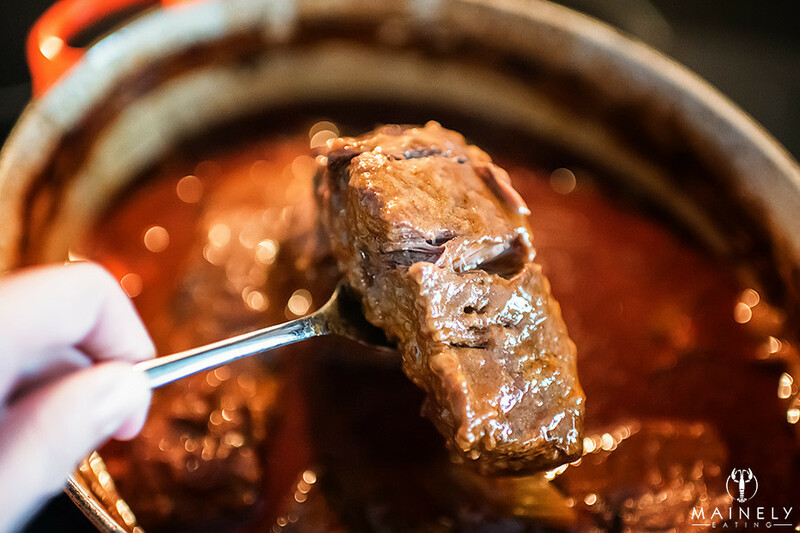 The word braise is French in origin and usually involves searing food at a high-temperatur and then finishing in a covered pot at a lowered temperature submerged in a liquid (which may also add flavor). I love the sweetness that carrots add to the braise but after 4+ hours of cooking they can get a little mushy. If you like a mushy carrot then it’s all good! If you’re fussy about your carrots like me, you can strain the braising liquid, remove the sacrificial carrots, onion and celery and then cook up a new batch of carrots to add back to the defatted sauce with the beef. Remove vegetables and pancetta from pot (set aside in bowl), add butter and olive oil to pot. Increase heat to high and quickly sear the pieces of floured meat. Don’t crowd the pan or the meat will just steam. You’re aiming for a nice brown crust. As each piece of meat is browned, remove to a plate. With heat still on high, pour in the beer and with a wooden spoon, really put some elbow grease in to loosen all of the brown fond (sticky brown cooked-in goodness) on the bottom of the pan. When the bottom of the pan feels smooth (like you’ve incorporated all of the toasty bits into the liquid), add the tomato paste. Add a tablespoon of the leftover seasoned flour and whisk until the tomato paste and flour are incorporated into the beer. The sauce should start to thicken up alarmingly at this point. Add the beef broth, soy sauce, Worcestershire sauce and pop the short ribs, vegetables and thyme back into the pot. You want the meat to be completely submerged so add a little more broth or water if you need to. Remove from oven, cool and refrigerate overnight. Easy option: Refrigerate the whole pot overnight. To serve, scrape off the yellow fat on the top and then cook at 350 degrees until piping hot. Pin or save this one for St Patrick’s Day! Variations: For a more “elegant” dish you can swap the beer for a hearty red wine and serve with buttered noodles and a crisp green salad. 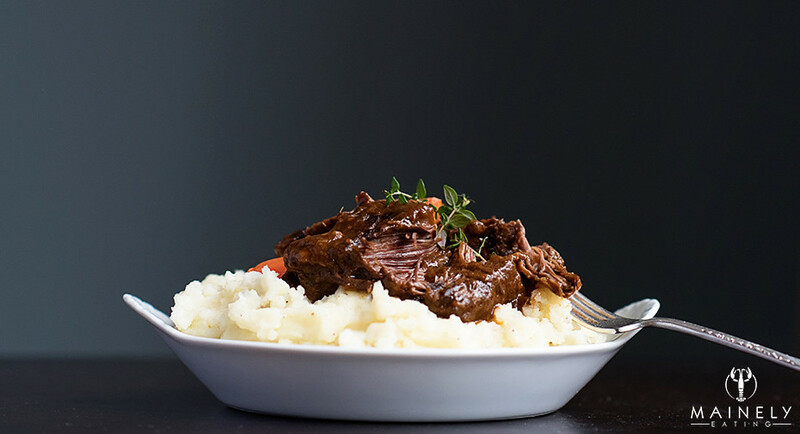 If you prefer to cook without alcohol, use unsalted beef stock.